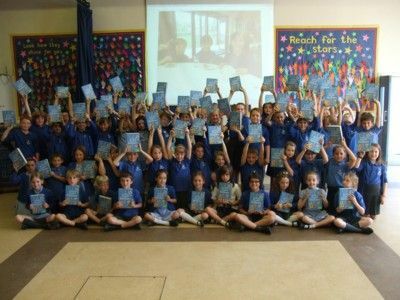 For many years, Cranleigh Rotary has been supporting local infant and junior schools as part of the Rotary Literacy Programme - an effort to help schools and promote educational excellence in the Cranleigh and Ewhurst area. The Club offers to provide year 4 students with copies of Usborne's Illustrated English Dictionaries, which are beautifully presented with over 1,000 illustrations. As an alternative, the Club offers £100 towards purchasing books for the school libraries. The type of support is decided after consultation with teaching staff, in order to best meet each school's needs. "Some years ago our Rotary Club presented dictionaries to children moving from primary to secondary school," said Cranleigh Rotary's President, Patrick Leake. "However, we now ask schools what they would prefer." 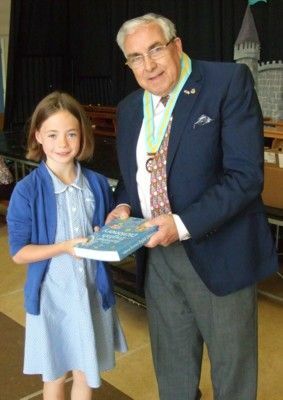 This year, Park Mead Primary School requested 64 dictionaries These were duly presented to year 4 pupils by Cranleigh Rotary's Immediate Past President, Tom Cornwell, on Friday, 15th July, following morning assembly. Each dictionary was labelled with the pupil's name and included a Rotary sticker. Cuthbert Mayne Primary School, Ewhurst Church of England Infant School and Cranleigh Church of England Primary School all chose to receive £100 to purchase books for their libraries. Ewhurst purchased five sets of Roald Dahl collection sets, each containing 15 books which will be used for group reading sessions. The other two schools have not yet decided which books to purchase.